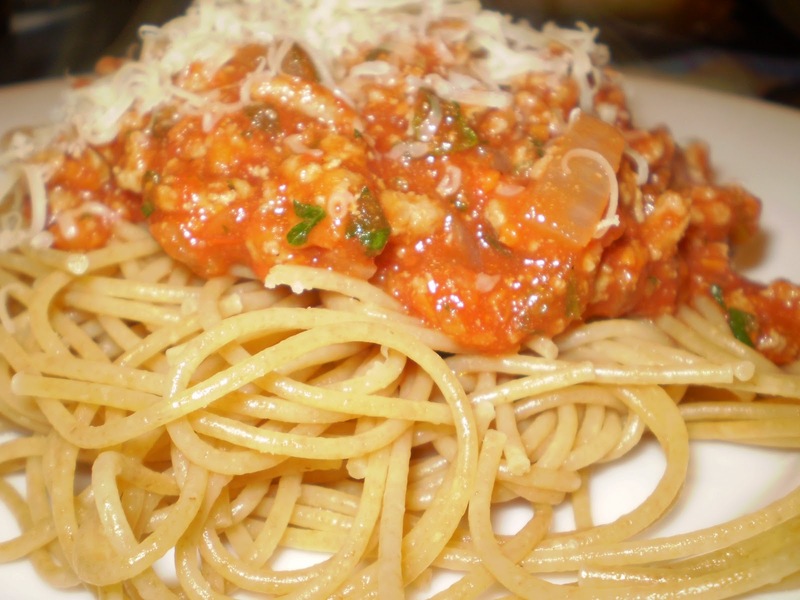 Spaghetti Bolognese is my absolute favorite food. I’ve loved it since I was a little kid who pronounced it “skabetti.” Making skabetti from scratch is fun because it is so easy, and gives you bragging rights. In a wok or large skillet, heat the olive oil. When hot, add the onion and garlic and saute over medium heat until the onions are soft, usually about eight minutes. Add the celery and carrot and saute for 5 minutes. Raise heat to high and add the ground meat. Saute, stirring frequently and breaking up any big chunks of meat. Cook for about ten minutes, until the meat is not pink. Add the tomatoes, parsley, basil, oregano and red pepper flakes and cook over medium low heat until the sauce thickens. Season with salt and pepper. This will take approximately thirty minutes. Finish bolognese with Parmigiano-Reggiano. Serve with your favorite pasta, preferably whole wheat to keep it healthy. This meal makes six servings. Adapted from Giada De Laurentis. Yes. I realize I cook many Giada meals.